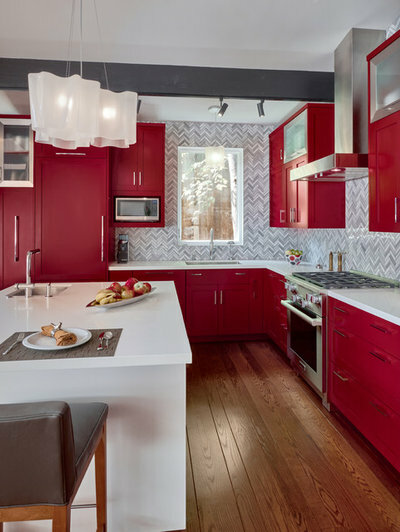 They always knew they liked their kitchen red. 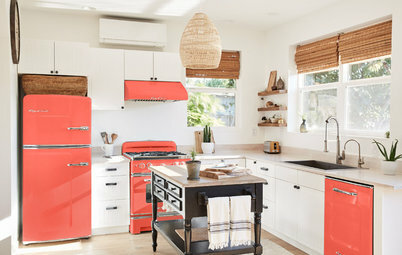 Eighteen years ago, after buying this Oakland, California, midcentury modern home, interior designer Cillesa Ullman and her husband scraped together enough money to paint their old oak cabinets red, change out the backsplash and invest in some new appliances. But limited counter space and storage had the couple ready to take on a more expansive renovation when time and budget permitted. 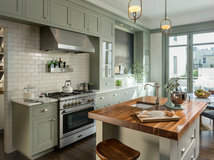 They finally were able to complete a full renovation recently, creating a space that would function for the way they work and live in the kitchen. They increased the storage and workspace, redesigned and expanded the island and installed all new cabinets, lighting, tile and appliances. 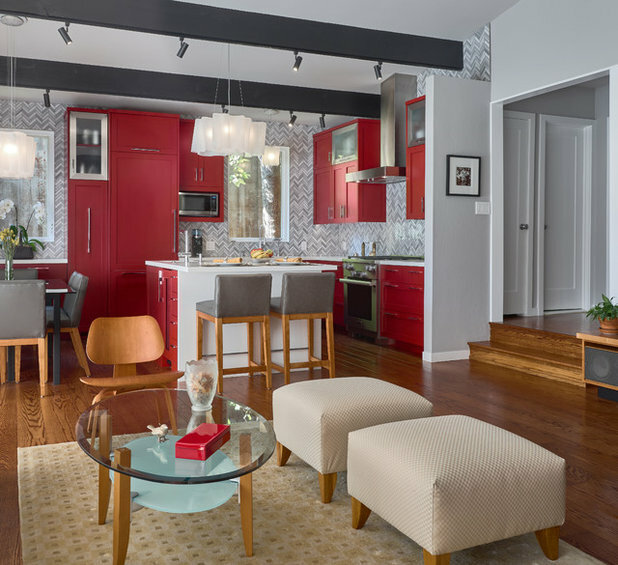 But the one element from the old kitchen they knew they wanted to keep was the energizing color red. “This is a very grown-up red,” Ullman says of Sherwin-Williams Chanticleer, a deep shade with blue undertones. She used a finish that was 40 percent gloss on the cabinets. 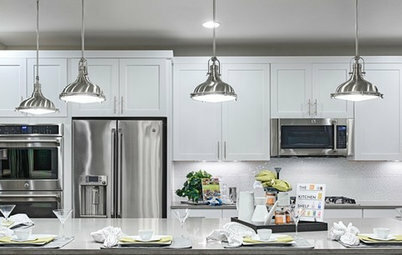 She added in some frosted glass doors on the highest cabinets, framed out in brushed stainless steel. “I love red but wanted to introduce something shiny too,” she says. The kitchen is open to the great room and dining room, so the spaces needed to work in concert to create a cohesive look. 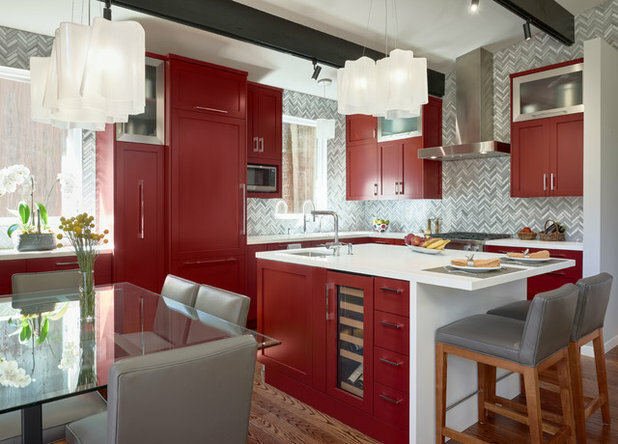 The deep red cabinetry provides a colorful backdrop viewed from the other rooms. 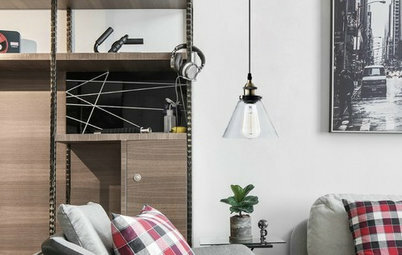 Three Logico lights float below the vaulted ceiling: a linear version over the dining table, a triple-nested trio over the island and a small pendant over the sink. “I love the softness these lights add to the room,” Ullman says. “They are made of glass but almost look like fabric. 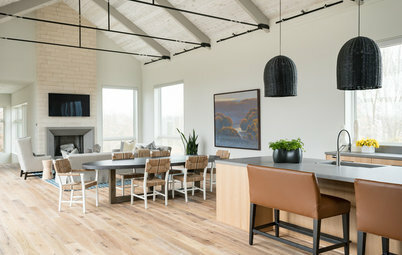 They also play off the hard lines in the room.” Modern track lights fit in well with the dark color of the ceiling beams they run along and illuminate the entire space. 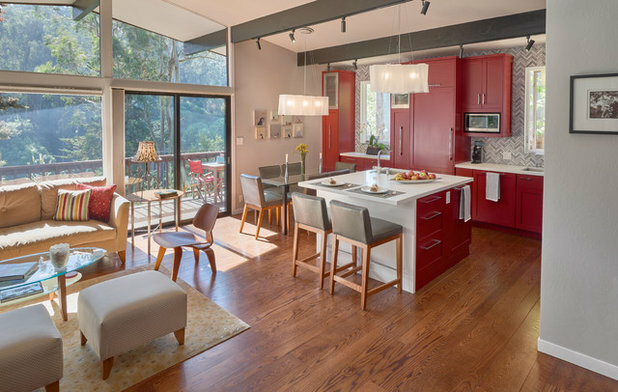 The red backdrop complements the expansive views beyond the wall of glass, which leads to a deck and overlooks a canyon full of oaks, eucalyptus trees and Monterey pines. “It’s all very indoor-outdoor when we entertain,” Ullman says. The new kitchen provides an inviting hub for gathering and serving. The pure white quartz of the countertop continues down the side of the island that faces the living room, finishing it off in an elegant way. 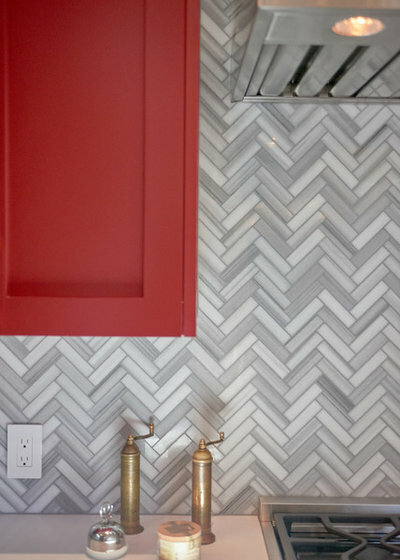 The quartz provides a strong contrast to the red and picks up on the white in the marble backsplash tile. Before: This was the kitchen prior to the full renovation. 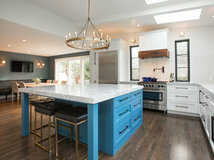 The perimeter countertop provided only about 4 linear feet of workspace, with the sink breaking it up in the middle, and the cooktop took up most of the island’s surface in the work triangle. 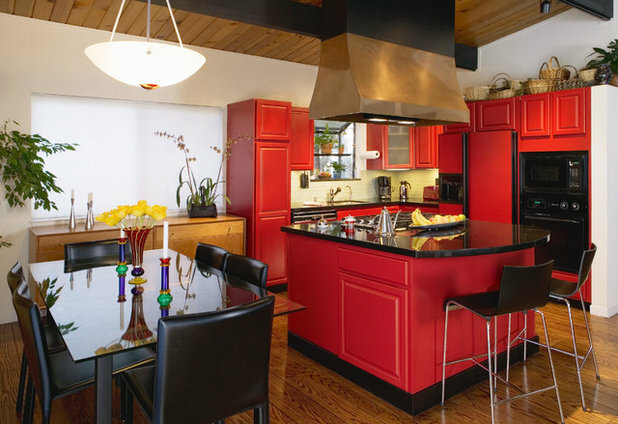 A bulky vent hood blocked the views and the ceiling lacked lighting. After: Ullman replaced the island stovetop with a new range along the perimeter, which gave them more work surface on the island and eliminated the cumbersome vent hood. She moved the refrigerator to the left of the sink, adding a microwave niche on one side and a pullout pantry on the other. She expanded the island to 50 by 70 inches. To the right of the range, she was able to push out the non-load-bearing wall (on the far right), which gave her 8 more inches of countertop and cabinetry space. 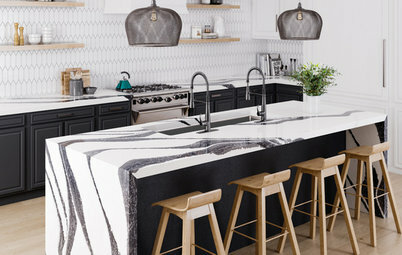 “That doesn’t sound like a lot, but it made a big difference to have that countertop space next to the range,” she says. She also expanded the kitchen’s footprint along the back wall of the dining room space. 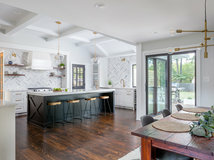 The island divides the working part of the kitchen from the dining room and bar area. On this side of the island is a refrigerated wine caddy, and the drawers next to it hold cocktail napkins, wine openers and charms, candles and candleholders. The work and prep side of the island is conveniently located in the middle of the work triangle, close to the fridge, main sink, microwave alcove and range. 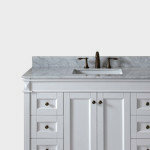 It also has its own prep sink, which also serves as a bar sink. Next to the prep sink are two refrigerated drawers for the pets’ special dietary needs. The couple have two African gray parrots and a mini lop rabbit, and they keep veggies and other foods for them separate from the people food. 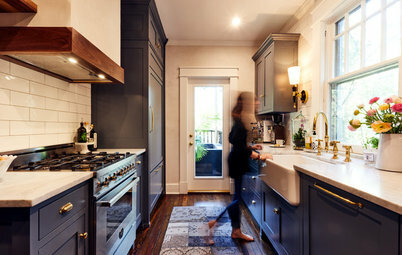 By moving the appliances around and expanding into the dining room’s footprint, the couple increased their countertop workspace by 13 linear feet. And by adding to the cabinetry (including 18 inches in increased height up top) they gained an additional 30.5 cubic feet of storage space. 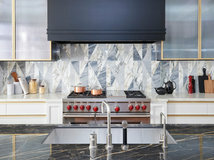 Specialized cabinets include a tilt-out for stoppers and sponges under the sink; a half-moon lazy Susan in the corner; vertical slats for baking sheets, cutting boards and trays; and a trash and recycling pullout. The coffee area is to the left of the sink — they store the beans over the microwave and the grinder sits on the counter. Ullman also expanded the cabinetry into the dining room. 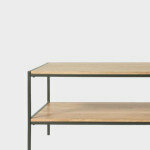 This was a carefully considered move — the storage here serves this area, and she customized it to fit the space. While standard cabinet depth is 24 inches, these towers are only 21 inches deep and the sideboard between them is a little less than that. 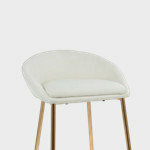 This provides enough space around the dining table to pull out chairs comfortably. 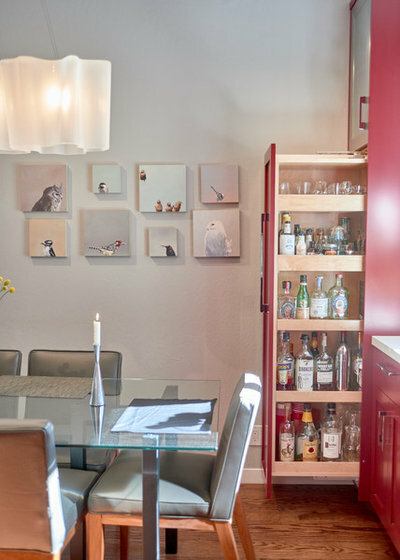 The tower on the left contains the bar, the one on the right is a pantry pullout and the space between serves as a sideboard for the dining room. It can be set up as a buffet or bar, depending on how the couple are entertaining, and it’s also close to the wine caddy in the island. The drawers in the sideboard cabinetry contain placemats, napkins and other linens. When finishing the room, the couple matched new pieces of red oak to the existing floors where needed. They also took the opportunity to pull some planks up to install a gas line to the wood-burning fireplace in the great room. This will be much safer in this part of California, which is vulnerable to wildfires. 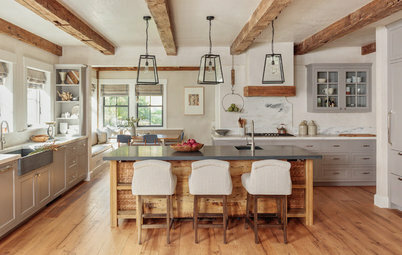 One big design decision that was hard on the couple was to cover the original pine planks on the ceiling with Sheetrock. Homes like this don’t have any space between the original pine ceiling planks and the roof to install the infrastructure required for a vent hood and lighting. Bliss Cappuccino Stone and Glass Linear Mosaic Tile, 12"x12"
To be honest, the only Mid Century thing about the kitchen is... not the kitchen. It used to look very 80's and now looks very modern but that specific shade of red doesn't read Mid Century to us. 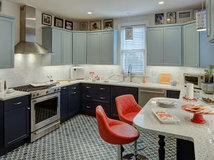 I love the red cabinets...there is a touch of red in almost every room in our two homes. And I've painted my french doors to the porch red to go with the slate flooring on the covered porch and all my red outdoor accessories. 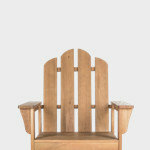 It gives such a great pop of interest and allows me to be less bold on the larger surfaces. A few years ago I had a red couch and my husband has a contemporary red recliner in our lower level family room with gray furniture and yellow/gold walls. 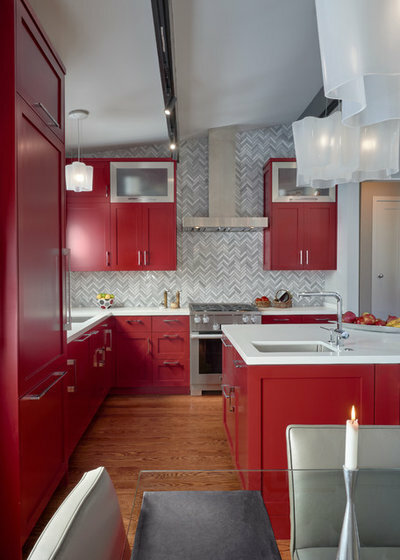 If my 91 year old mother could build a home, it would have a red kitchen like this. I love the red and gray. 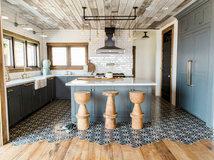 My kitchen is much more neutral, with natural wood and golden/tan walls - but if I were going for funky, I’d definitely like something like this. 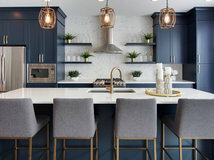 I’m about to sell my place so very relieved my cabinets and walls are neutral - easier to match any color and style of furniture.